Angela Carter’s work is a collage of discourses and genres. The challenge of finding a critical framework, complex and accurate enough to classify her work, has remained. 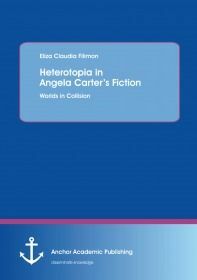 The spectacular and the pragmatic threads of her texts, framed by extreme seriousness and witty humour are unravelled with the help of a different metaphor, denoting enigmatic spaces, conterdiscourses, borders of otherness – heterotopia. Five novels out of nine, five short stories out of thirty-five, as well as Carter’s two film adaptations are filtered through a term extricated from its medical and geographical roots, which emphasizes the ambiguity, as well as the dialogic interaction of Angela Carter’s often discordant discourses that have kept her at the top of the literary canon.